M170 | 981 m. | 3219 ft.
Residing in our marvellous house on the Coulin Estate meant that reaching the start of the hike involved only a fifteen minute drive to Kinlochewe. The day started out with good weather. At the parking in Incherill we changed into boots and packed our rucksacks in sunshine and cold air. Then everything was where it should be and we embarked on this long-anticipated hike along the north shore of Loch Maree towards Gleann Bianasdail. As can be read in many a description this six or seven kilometre walk first along the banks of the Kinlochewe River and then a little further on along the shore of the loch is very pleasant, a little undulating and much of the stretch can be covered walking on grass. It would have been a perfect day had we not encountered a succession of rather smelly carcasses of decomposing deer which littered the shoreline every now and then. Winter had been long and hard! All in all we saw eight or ten of them; and smelled one or two more. Yuck! After 70 or 80 minutes we crossed the bridge over the Abhainn an Fhasaigh and immediately turned due north along the somewhat rough path that climbs grassy slopes interspersed with inclined and horizontal slabs of sandstone. The slope gets steeper the higher up you get. Sgurr Dubh boldly rises ahead to the left and we followed the path heading for the beallach between this hill and Meall Each. At about 500m the first specs of snow appeared and close to where the path levels off as it reaches the flat expanse of Coire Tuill Bhain it turned into a quagmire of slush and muck. Checking out the two possible ways to the summit(s) from the corrie we soon decided that in these conditions of late winter and us carrying no ropes the more sensible approach seemed to be via Sgurr an Tuill Bhain and its south-east ridge which throws one arm down towards the corrie floor. We crossed the corrie where deep snow covered the heather and climbed up towards the south-east ridge of the Sgurr. Once at an altitude of 750 to 800m the wind picked up and one additional layer of fleece had to be added as another sheet of insulation against the wind-chill. Higher up on the steeper sections of the ridge leading to Sgurr an Tuill Bhain the wind became a real impediment to walking. Looking west from a spot just below the summit of Sgurr an Tuill Bhain we could see a front of heavy snow showers moving quickly towards us. And when the snow hit us goggles came on and we stumbled forward onto the final two kilometres of narrow ridge towards the summit of Slioch. To quote from Mr Storer’s book 100 Best Routes on Scottish Mountains: “Under snow the ridge between Sgurr an Tuill Bhain and Slioch’s north top makes a good introduction to narrow winter ridge walking”. Amen to that and let me add that hip-deep snow and iced over rocks required a little more than a beginner’s level of expertise to make it to the summit safely in strong winds and driving snow: Luckily the wind on the high ridge was somewhat less intense than what we had encountered on our climb to Sgurr an Tuill Bhain. Needless to say that the views were not all that expansive and we were lucky to get glimpses towards Fisherfield and the tops surrounding Coire Tuill Bhain. Finally the summit came into view and we touched the well-earned cairn of this magnificent hill (location confirmed by GPS – to be sure in the almost whiteout conditions). Even though we couldn’t enjoy the scenery and not much could be seen of the cliffs dropping away towards the north and west we stayed at the summit for a few minutes to regain our strength and composure. But when no sunny window would appear in the snow showers we decided to make our way back towards the safety of Coire Tuill Bhain by retracing our steps. Retracing the steps in a literal sense was not possible since the wind and driving snow had almost obliterated our footsteps after maybe twenty minutes. But route-finding was not an issue, of course, on this narrow ridge. We fought our way back to Sgurr an Tuill Bhain. Now, for a change, the right halves of our faces were battered by the wind and snow – call it poetic justice if you will. But then we finally made it back onto the broad south-east ridge of the Sgurr and went down steeper slopes than used for the ascent. This brought us back into the flat bowl of Coire Tuill Bhain. There we peeled of a layer or two of fleece, drank some water, ate a well-earned Mars bar and then re-crossed the corrie towards the beallach between Sgurr Dubh and Meall Each. From there it was “only” another 550m down the very stony path to the shore of Loch Maree. We finally got there and rested for a quarter of an hour in the light drizzle once we were back across the bridge over the Abhainn an Fhasaigh which really was in spate now. A flock of mountain goats came closer and closer as we were sitting there more or less motionless so that we might not scare them off. The return leg from the bridge to Incherill was uneventful but our legs were aching a bit and the dead deer still smelled horribly. Then after 20 kilometres of walking and maybe 1.200 metres of ascent had been completed on the hike we finally got back to our car which waited for us in what I now remember as late afternoon sunshine. At least it felt like that after the heavy snow and atrocious winds we had had to endure on the hill. A memorable hill walk thus came to a good end. This was a hill exceptionally well-earned and I can say that Frank and I are looking forward to coming back to Slioch in nice sunny September weather to do the complete circuit of the mountain’s horseshoe ridge and to enjoy the great views. Description Slioch is a solitary Torridonian sandstone mountain on the north side of Loch Maree, about 7 kilometres north-west of Kinlochewe. 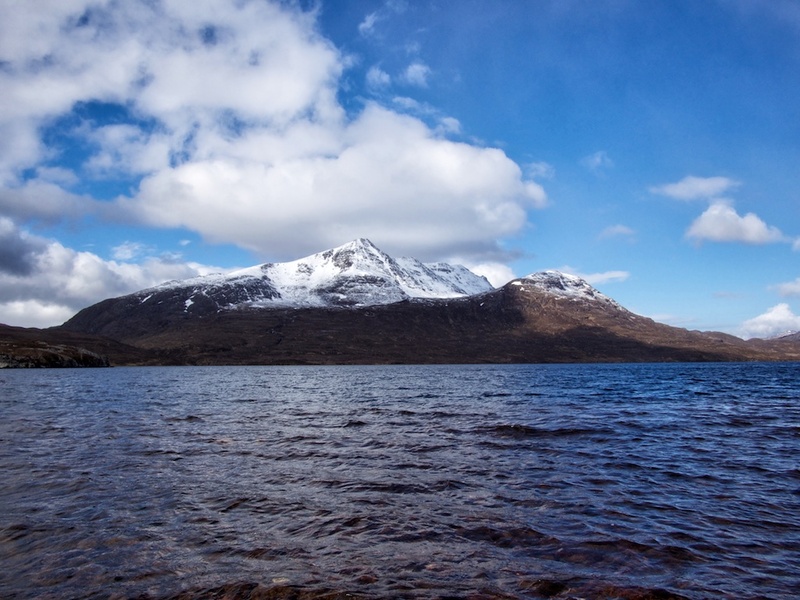 Its isolated position and formidable appearance are well seen in views of the mountain across Loch Maree. The southern and western perimeter of Slioch is a continuous bastion of sandstone buttresses and gullies which extend round to the northern side below Sgurr an Tuill Bhain. The eastern half of the mountain is a large open corrie, the Coire na Sleaghaich. The ascent is best made from Kinlochewe, starting along the path on the north side of the Kinlochewe River to the foot of Gleann Bianasdail. Go up the path on the north-west side of this glen for 1 kilometre and then bear due north between Sgurr Dubh and Meall Each and round the north side of Sgurr Dubh to reach the south-east ridge of Slioch. Continue up this ridge past two lochans and then more steeply to the summit, which is the north top and not the trig point. Traverse east along a fine ridge to Sgurr an Tuill Bhain and from there descend due south across the lower part of Coire na Sleaghaich to rejoin the uphill route.